The moon took on an eerie blood-red hue early Tuesday during the first total lunar eclipse of 2014, a celestial sight that wowed potentially millions of stargazers across North and South America. The total lunar eclipse of April 15 lasted about 3.5 hours between late Monday and early Tuesday, with the Earth’s shadow slowing darkening the face of the so-called “Blood Moon” in a jaw-dropping sight for stargazers willing to stay up extra late or rise super-early for the event. Photographer Sean Parker of Tucson, Ariz., created this mosaic of the total lunar eclipse phases on April 15, 2014 using images taken with a through a 12″ LX Meade 200 telescope with a Canon 6D camera. The lunar eclipse peaked at 3 a.m. EDT (0700 GMT), with the moon taking 78 minutes to pass through the darkest point of Earth’s shadow. It was visible from most of North and South America, Hawaii and parts of Alaska. The eclipse was the first of four consecutive total lunar eclipses, known as a “tetrad,” between April 2014 and September 2015. Astronomer Bob Berman, who hosted a live lunar eclipse webcast for the Slooh community telescope using views from Arizona’s Prescott Observatory, said event was also one for the record books because of another bright object in the predawn sky. Mars made its closest approach to Earth since 2008 on Monday night (April 14), coming within 57.4 million miles (92.4 million km) of our planet. So the Red Planet and the “Blood Moon” shined together in the predawn sky in a rare event, Berman said, adding that the bright blue star Spica completed the show. The following post, and the Amazing Gif Via Time.. Millions of people were greeted last night with a strange celestial sighting, the “blood moon” lunar eclipse. The phenomenon occurs when the moon passes into the earth’s shadow and, for about an hour, takes on a reddish hue from the sunlight being refracted around the earth’s horizon. Due to cloud cover over much of North America, many people, particularly on the east coast, didn’t get a chance to see the blood moon Tuesday morning. Don’t worry though, we’ve got a time lapse of the event for you right here. In 2014, there are two solar eclipses and two total lunar eclipses as follows. Predictions for the eclipses are summarized in Figures 1, 2, 3, and 4. World maps show the regions of visibility for each eclipse. The lunar eclipse diagrams also include the path of the Moon through Earth’s shadows. Contact times for each principal phase are tabulated along with the magnitudes and geocentric coordinates of the Sun and Moon at greatest eclipse. The first eclipse of the year is well placed for observers throughout the Western Hemisphere. The eclipse occurs at the lunar orbit’s ascending node in Virgo. The apparent diameter of the Moon is close to its average since the eclipse occurs nearly midway between apogee (April 08 at 14:53 UT) and perigee (April 23 at 00:28 UT). This is the first of four consecutive total lunar eclipses in 2014 and 2015 (see Lunar Eclipse Tetrads). The Moon’s orbital trajectory takes it through the southern half of Earth’s umbral shadow. Although the eclipse is not central, the total phase still lasts 78 minutes. The Moon’s path through Earth’s shadows as well as a map illustrating worldwide visibility of the event are shown in Figure 1. The times of the major eclipse phases are listed below. At the instant of greatest eclipse (07:45:40 UT) the Moon lies at the zenith for a point in the South Pacific about 3000 km southwest of the Galapagos Islands. The umbral eclipse magnitude peaks at 1.2907 as the Moon’s northern limb passes 1.7 arc-minutes south of the shadow’s central axis. In contrast, the Moon’s southern limb lies 9.0 arc-minutes from the southern edge of the umbra and 40.0 arc-minutes from the shadow centre. Thus, the northern half of the Moon will appear much darker than the southern half because it lies deeper in the umbra. Since the Moon samples a large range of umbral depths during totality, its appearance will change significantly with time. It is not possible to predict the exact brightness distribution in the umbra, so observers are encouraged to estimate the Danjon value at different times during totality (see Danjon Scale of Lunar Eclipse Brightness). Note that it may also be necessary to assign different Danjon values to different portions of the Moon (i.e., north verses south). During totality, the spring constellations are well placed for viewing so a number of bright stars can be used for magnitude comparisons. Spica (m = +1.05) is the most conspicuous star lying just 2° west of the eclipsed Moon. This juxtaposition reminds the author of the total lunar eclipse of 1968 Apr 13 when Spica appeared only 1.3° southwest of the Moon at mid-totality. The brilliant blue color of Spica made for a striking contrast with the crimson Moon. Just a week past opposition, Mars (m = -1.4) appears two magnitudes brighter than Spica and lies 9.5° northwest of the Moon. Arcturus (m = +0.15) is 32° to the north, Saturn (m = +0.2) is 26° to the east, and Antares (m = +1.07) is 44° to the southeast. The entire event is visible from both North and South America. Observers in the western Pacific miss the first half of the eclipse because it occurs before moonrise. Likewise most of Europe and Africa experience moonset just as the eclipse begins. None of the eclipse is visible from north/east Europe, eastern Africa, the Middle East or Central Asia. Table 1 lists predicted umbral immersion and emersion times for 25 well-defined lunar craters. The timing of craters is useful in determining the atmospheric enlargement of Earth’s shadow (see Crater Timings During Lunar Eclipses). The first solar eclipse of 2014 occurs at the Moon’s descending node in southern Aries. This particular eclipse is rather unusual because the central axis of the Moon’s antumbral shadow misses Earth entirely while the shadow edge grazes the planet. Classified as a non-central annular eclipse, such events are rare. Out of the 3,956 annular eclipses occurring during the 5,000-year period -2000 to +3000, only 68 of them or 1.7% are non-central (Espenak and Meeus, 2006). The northern edge of the antumbral shadow first touches down in Antarctica at 05:57:35 UT. The instant of greatest eclipse occurs just six minutes later at 06:03:25 UT. For an observer at the geographic coordinates nearest the shadow axis (131° 15.6′ E, 79° 38.7′ S), the Sun would appear on the horizon during the 49-second annular phase. Six minutes later (06:09:36 UT), the antumbral shadow lifts off the surface of Earth as the annular eclipse ends. The entire zone of annularity appears as a small D-shaped region in eastern Antarctica (Figure 2). A partial eclipse is seen within the much broader path of the Moon’s penumbral shadow, that includes the southern Indian Ocean, the southern edge of Indonesia and all of Australia (Figure 2). Local circumstances for a number of cities in Australia are found inTable 2. All times are given in Universal Time. The Sun’s altitude and azimuth, the eclipse magnitude and obscuration are all given at the instant of maximum eclipse. The second lunar eclipse of 2014 is also total and is best seen from the Pacific Ocean and bordering regions. The eclipse occurs at the Moon’s descending node in southern Pisces, two days after perigee (October 06 at 09:41 UT). This means that the Moon will appear 5.3% larger than it did during the April 15 eclipse (32.7 vs. 31.3 arc-minutes). This time the orbital path of the Moon takes it through the northern half of Earth’s umbral shadow. The total phase lasts 59 minutes primarily because the diameter of the umbral shadow is larger (1.49° verses 1.39°). The lunar path through Earth’s shadows as well as a map illustrating worldwide visibility of the event are shown in Figure 3. The times of the major eclipse phases are listed below. At the instant of greatest eclipse (10:54:36 UT) the Moon lies near the zenith from a location in the Pacific Ocean about 2000 km southwest of Hawaii. At this time, the umbral magnitude peaks at 1.1659 as the Moon’s southern limb passes 6.6 arc-minutes north of the shadow’s central axis. In contrast, the Moon’s northern limb lies 5.4 arc-minutes from the northern edge of the umbra and 39.3 arc-minutes from the shadow centre. As a result, the southern half of the Moon will appear much darker than the northern half because it lies deeper in the umbra. The Moon samples a large range of umbral depths during totality so its appearance will change considerably with time. The exact brightness distribution in the umbra is difficult to predict, so observers are encouraged to estimate the Danjon value at different times during totality (see Danjon Scale of Lunar Eclipse Brightness). It may also be necessary to assign different Danjon values to different portions of the Moon (e.g., north vs. south). During totality, the autumn constellations are well placed for viewing and the brighter stars can be used for magnitude comparisons. The center of the Great Square of Pegasus lies 15° to the northwest, its brightest star being Alpheratz (m = +2.02). Deneb Kaitos (m = +2.04) in Cetus is 30° south of the eclipsed Moon, while Hamal (m = +2.01) is 25° to the northeast, Aldebaran (m = +0.87) is 56° to the east, and Almach (m = +2.17) is 40° to the north. Although relatively faint, the planet Uranus (m = +5.7) lies just 2/3° southeast of the Moon during totality. Is a transit of the Earth and Moon across the Sun’s disk visible from Uranus during the eclipse? An interesting idea but calculations show a miss. From Uranus, the Sun’s disk is only 1.7 arc-minutes in diameter and this is a very small target to hit. Nevertheless, transits of Earth from Uranus are possible – the next one takes place on 2024 November 17 (Meeus, 1989). The entire October 08 eclipse is visible from the Pacific Ocean and regions immediately bordering it. The northwestern 1/3 of North America also witnesses all stages. Farther east, various phases occur after moonset. For instance, the Moon sets during totality from eastern Canada and the USA. Observers in South America also experience moonset during the early stages of the eclipse. All phases are visible from New Zealand and eastern 1/4 of Australia – the Moon rises during the early partial phases from Australia’s west coast. Most of Japan and easternmost Asia catch the entire eclipse as well. Farther west in Asia, various stages of the eclipse occur before moonrise. None of the eclipse is visible from Europe, Africa, and the Middle East. Table 3 lists predicted umbral immersion and emersion times for 25 well-defined lunar craters. The timing of craters is useful in determining the atmospheric enlargement of Earth’s shadow (see Crater Timings During Lunar Eclipses). The final event of 2014 occurs at the Moon’s ascending node in southern Virgo. 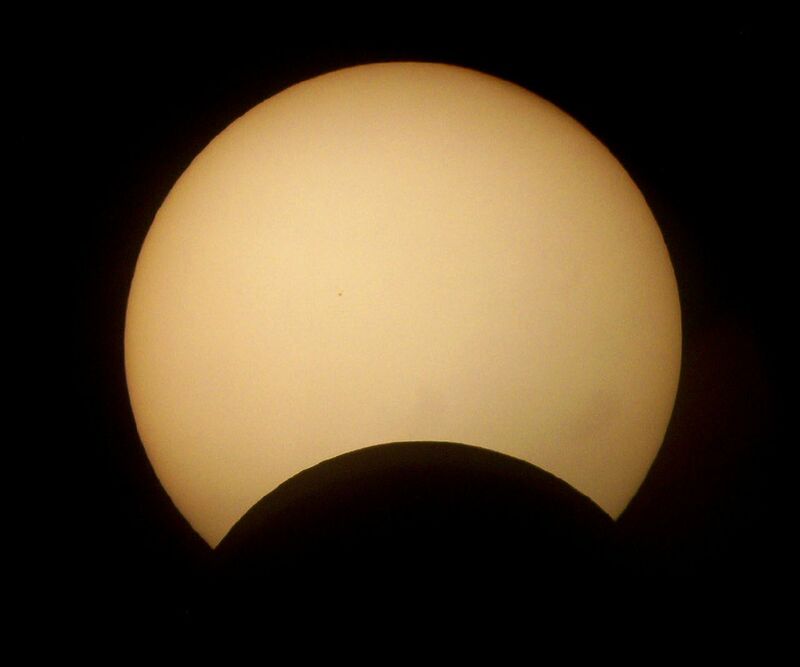 Although it is only a partial solar eclipse, it is of particular interest because the event is widely visible from Canada and the USA (Figure 4). The penumbral shadow first touches Earth’s surface near the Kamchatka Peninsula in eastern Siberia at 19:37:33 UT. As the shadow travels east, much of North America will be treated to a partial eclipse. The eclipse magnitude from cities like Vancouver (0.658), San Francisco (0.504), Denver (0.556), and Toronto (0.443) will surely attract the media’s attention. Greatest eclipse occurs at 21:44:31 UT in Canada’s Nunavut Territory near Prince of Wales Island where the eclipse in the horizon will have a magnitude of 0.811. At that time, the axis of the Moon’s shadow will pass about 675 km above Earth’s surface. A sunset eclipse will be visible from the eastern half of the USA and Canada (except for the far northeast). The partial eclipse ends when the penumbra leaves Earth at 23:51:40 UT. Local circumstances and eclipse times for a number of cities in Canada and Mexico are listed in Table 4, and for the USA in Table 5. All times are in Local Daylight Time. The Sun’s altitude and azimuth, the eclipse magnitude and eclipse obscuration are all given at the instant of maximum eclipse. When the eclipse is in progress at sunset, this information is indicated by ‘- s’. The lunar eclipses of 2014 are the first of four consecutive total lunar eclipses – a series known as a tetrad. During the 5000-year period from -1999 to +3000, there are 4378 penumbral eclipses (36.3%), 4207 partial lunar eclipses (34.9%) and 3479 total lunar eclipses (28.8%). Approximately 16.3% (568) of all total eclipses belong to one of the 142 tetrads occurring over this period (Espenak and Meeus, 2009). The mechanism causing tetrads involves the eccentricity of Earth’s orbit in conjunction with the timing of eclipse seasons (Meeus, 2004). During the present millennium, the first eclipse of every tetrad occurs sometime from February to July. In later millennia, the first eclipse date gradually falls later in the year because of precession. Italian astronomer Giovanni Schiaparelli first pointed out that the frequency of tetrads is variable over time. He noticed that tetrads were relatively plentiful during one 300-year interval, while none occurred during the next 300 years. For example, there are no tetrads from 1582 to 1908, but 17 tetrads occur during the following 2 and 1/2 centuries from 1909 to 2156. The ~565-year period of the tetrad “seasons” is tied to the slowly decreasing eccentricity of Earth’s orbit. Consequently, the tetrad period is gradually decreasing (Meeus, 2004). In the distant future when Earth’s eccentricity is 0, tetrads will no longer be possible. The umbral magnitudes of the total eclipses making up a tetrad are all relatively small. For the 300-year period 1901 to 2200, the largest umbral magnitude of a tetrad eclipse is 1.4251 on 1949 Apr 13. For comparison, some other total eclipses during this period are much deeper. Two examples are the total eclipses of 2000 Jul 16 and 2029 Jun 26 with umbral magnitudes of 1.7684 and 1.8436, respectively. Table 6 gives the dates of each eclipse in the 8 tetrads occurring during the 21st century. The tetrad prior to 2014-15 was in 2003-04 while the next group is nearly 20 years later in 2032-33. NASA’s Six Millennium Catalog of Phases of the Moon. All above information via NASA. Lunar eclipses occur when Earth’s shadow blocks the sun’s light, which otherwise reflects off the moon. There are three types, with the most dramatic being a total lunar eclipse, in which Earth’s shadow completely covers the moon. The last lunar eclipse was on Nov. 28, 2012. The next lunar eclipse is on April 25, 2013. It will be a partial eclipse, visible from Europe, Africa, Asia and Australia. But a month later, on May 25, a penumbral eclipse will be visible from the Americas and Africa. This montage of images taken by skywatcher Kieth Burns shows the Dec. 20, 2010 total lunar eclipse. The photos won a NASA contest to become an official NASA/JPL wallpaper for the public. Total eclipses are a freak of cosmic happenstance. Ever since the moon formed, about 4.5 billion years ago, it has been inching away from our planet (by about 1.6 inches, or 4 centimeters per year). The setup right now is perfect: the moon is at the perfect distance for Earth’s shadow to cover the moon totally, but just barely. Billions of years from now, that won’t be the case. Total lunar eclipse: Earth’s full (umbral) shadow falls on the moon. The moon won’t completely disappear, but it will be cast in an eerie darkness that makes it easy to miss if you were not looking for the eclipse. Some sunlight passing through Earth’s atmosphere is scattered and refracted, or bent, and refocused on the moon, giving it a dim glow even during totality. If you were standing on the moon, looking back at the sun, you’d see the black disk of Earth blocking the entire sun, but you’d also see a ring of reflected light glowing around the edges of Earth — that’s the light that falls on the moon during a total lunar eclipse. Partial lunar eclipse: Some eclipses are only partial. But even a total lunar eclipse goes through a partial phase on either side of totality. During the partial phase, the sun, Earth and moon are not quite perfectly aligned, and Earth’s shadow appears to take a bite out of the moon. Penumbral lunar eclipse: This is the least interesting type of eclipse, because the moon is in Earth’s faint outer (penumbral) shadow. Unless you’re a seasoned skywatcher, you likely won’t notice the effect. The moon may turn red or coppery colored during the total portion of an eclipse. The red moon is possible because while the moon is in total shadow, some light from the sun passes through Earth’s atmosphere and is bent toward the moon. While other colors in the spectrum are blocked and scattered by Earth’s atmosphere, red light tends to make it through easier. The effect is to cast all the planet’s sunrises and sunsets on the moon. The moon turned a blood red over the Sossusvlei Desert Lodge on NamibRand Nature Reserve in Namibia in this stunning photo taken by skywatcher George Tucker on June 15, 2011. Christopher Columbus leveraged a blood-red eclipse in 1504 to frighten natives on Jamaica into feeding him and his crew. It was on Columbus’ fourth and final voyage to the New World. An epidemic of shipworms ate holes in the ships of his fleet; Columbus’ was forced to abandon two ships. He then beached his last two on Jamaica on June 25, 1503. The natives welcomed the castaways and fed them. But after six months, Columbus’ crew mutinied, and robbed and murdered some of the Jamaicans, who had grown weary of feeding the crew. Columbus had an almanac that foretold a lunar eclipse on Feb. 29, 1504. He met the local chief, and told him the Christian god was angry with his people for no longer supplying food. Columbus said to expect a sign of God’s displeasure three nights later, when He would make the full moon appear “inflamed with wrath.” When the blood-red moon came to pass, the natives were terrified and “with great howling and lamentation came running from every direction to the ships laden with provisions,” according to an account from Columbus’ son. Just before the total phase of the eclipse was about to end, Columbus said God had pardoned the natives and would bring the moon back. The crew was well fed until help arrived in November and Columbus and his men sailed back to Spain. April 25, 2013: Partial Lunar Eclipse: Visible from Europe, Africa, Asia and Australia. May 25, 2013: Penumbral Lunar Eclipse: Visible from the Americas and Africa. Oct. 18, 2013: Penumbral Lunar Eclipse: Visible from the Americas, Europe, Africa and Asia. April 15, 2014: Total Lunar Eclipse: Visible from the Americas, Australia and out in the Pacific Ocean. Oct. 8, 2014: Total Lunar Eclipse: Visible from the Americans, Asia, Australia and in the Pacific Ocean. the Americans, Asia, Australia and in the Pacific Ocean. This photo of the Dec. 20 total lunar eclipse by Jimmy Westlake shows the blue edge to Earth’s shadow set against the reddened moon. Lunar eclipses are among the easiest skywatching events to observe. Simply go out, look up, and enjoy. You don’t need a telescope or any other special equipment. However, binoculars or a small telescope will bring out details in the lunar surface — moonwatching is as interesting during an eclipse as anytime. If the eclipse occurs during winter, bundle up if you plan to be out for the duration — an eclipse can take a couple hours to unfold. Bring warm drinks and blankets or chairs for comfort. [Lunar Eclipse Pictures | More Pictures | And More Pictures] Via Space.com for ORIGINAL Story..